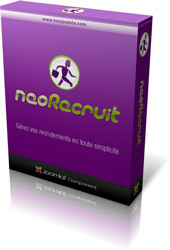 The module NeoRecruit Latest Offers is now Joomla 3 ready ! The module NeoRecruit Latest Offers is now compatible with Joomla 3 ! So you can now automatically highlight your latest job offers published with the component NeoRecruit, on the latest version of Joomla. The module is always free, and available in just a few clicks in the "Extensions" section of the portal.